After moving past a previous marriage, we hope that we can get closer to perfect with that next marriage. We all have a more realistic view of life knowing that things don’t always turn out the way we want, but we certainly have a hope that they will. Today I am going to focus on these issues, but I am going to spotlight myself. This episode is especially hard to do because I am human and I would like to always put my best foot forward when it comes to my image with others. But I think showing you how real I am will hopefully help you to know that you don’t have to be perfect and if you aren’t that ultimately it will be okay. You are going to continue to mess up and not get it right. 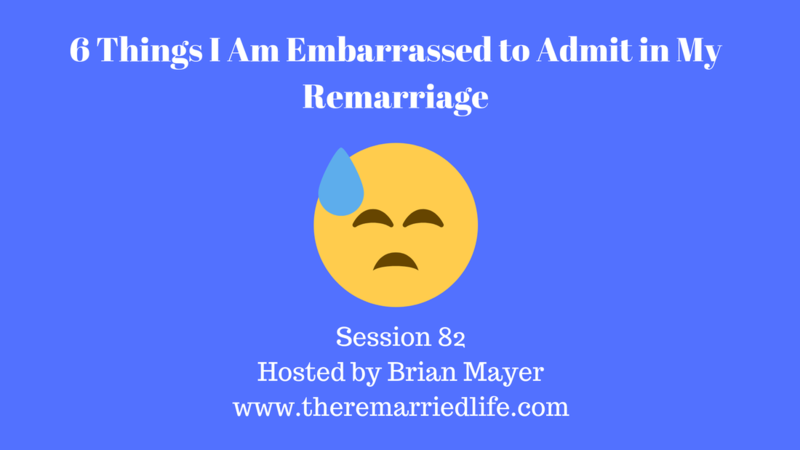 So here goes, let’s talk about the X things that I find most embarrassing in my remarried life journey. At this point, I been married to my wife for about 14 years and I hate to admit that a couple of years in we had an argument so bad that I uttered the question, “Do you want a divorce?” Wow talk about the most terrible feeling in the world. I have had lots of self talk about that one, and I made the decision to never say those words again and fortunately I have stuck to that. During some difficult times parenting my daughter, there we times where I sided with my daughter. I am certainly not proud of these moments and in looking back I did feel caught in the middle for sure. However, it came at a time where I made assumptions that my wife (my daughter’s stepmom) must have been talking in a way that I didn’t agree with (even though I later discovered this not to be true). I once got so angry about my daughter not talking or sharing what was going on that I yelled at her at the top of my lungs. Again I felt caught in the middle because my wife was telling me I needed to be harder on my daughter for the things she was saying and doing, and I had moments where I flipped back and forth on my feelings on this. And one of my problems is that I will hold things in sometimes, just hoping that others will get it and do their part and when that does not happen I blow my lid. This is one part of my life that I have worked hard to overcome and something I am getting better at and certainly not proud of. I let bitterness and resentment build up in my toward the actions my daughter was taking about not wanting to live with us anymore. I remember putting up an emotional wall and making decisions not to engage with or talk to her as much as I used to. I suppose this was a defense mechanism because I was tired of getting hurt. This isn’t necessarily something I am embarrassed about but at some point my wife and I sought out help from some fellow marriage mentors at our church to talk about our parenting issues and differences. Of course, I wish we could have figured it out on our own but we needed help. At the time this was really hard to want to admit especially since we were marriage mentors ourselves. But nevertheless sometimes I have to admit when I need help and that was one time I needed it. Not working early on in the marriage to set a plan for parenting and expectations early. This was a lot of the cause of the stress early on. So I embarrassed to say that I didn’t learn from the first marriage as much as I should have about making more solid plans to be a team on the issues. Instead of I subconsciously made the decision to meander again through a marriage and sure enough it hit major rough patches. As always remember that marriage is not something you have, it is something you do. Talk to you next week unless you are binge listening in the future in which case I will talk to you in about a minute! Take care.